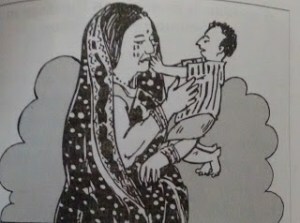 Hello everyone, this is an Sample PPDT practice set on A WOMAN IS WEEPING AND A CHILD IS STOPPING HER . This is a part of PPDT Practice set , which may come across during your SSB Psychological TAT or on SSB Screening PPDT. I have also uploaded many sample psychological PPDT and TAT stories for your preparation earlier. Practice more and more for better practice. The husband of Farzana was killed while fighting with the terrorists in the outskirt of Srinagar . In the picture we see that she is weeping and expressing sorrow during funeral procession of her husband. At the same time she is making her mind to plan for self-employment as her husband was the only earning member in the family .She knew that there was a provision of financial assistance to the dependents of deceased persons, who sacrificed their live in fighting with terrorists. She already possessed some knowledge about the knitting of Kashmiri shawls, one of the reputed and job oriented institutes. On completion of successful training she came out with adequate knowledge about the latest designs of the shawls. She got financial assistance from state Government. She started a small industry near the market after employing the skilled and efficient staff who could work fast in the industry as per her guidance. Farzana could manage better quantity, quality and designs of the shawls. She also arranged necessary publicity about the product through the electronic and the print media. The demand of the product increased in the market day by day. Farzana could succeed in establishing and enlarging the industry within a few years, enhancing her standard of living and image in the society, providing jobs to numerous youths. Looking after her children nicely and also providing good education to them she led a self -dependent, respectable and happy life. 4 comments to ''DAY 1 PPDT PRACTICE SET STORY 20: A WOMAN IS WEEPING AND A CHILD IS STOPPING HER"
The husband of Alisha is the CO in the Indian military and he came house after a long time but due to some emergency he had to join his duty immediately.There was a terror attack and her husband took some major actions to kill the terrorist and finally he was awarded for the same and told her wife about it and after listening to it she felt proud of her husband and start weeping as she was unable to control her emotion. Saumya is a wife of a soldier and having marrage two years ago and have a child of 2 years.It is the4 time of kargil war and her husband on duty on bagha border.one day when she is playing with her child she got a telephone and heard the news of his husband death.she got sorrow and start weeping and hewr chiuldren try to stop her in innocent manner.she makes herself mentally strong and take decision to make their child mentally and physically bstrong who serves country like their father and take revenge from enemy.she toil her child very well and her dedication towards her dream make it possible to give effective qulitry in their children who also work very hard and got selected in NDA and make his mother to proud and complete her dream.